← Cinnamon Glazed Nuts – Two Ways! In heavy saucepan combine marshmallow creme, butter, and semisweet chocolate chips. Cook over low heat until chocolate is melted and mixture is smooth, stirring constantly. Remove from heat. Stir crisp rice cereal into chocolate mixture, mixing until thoroughly combined. 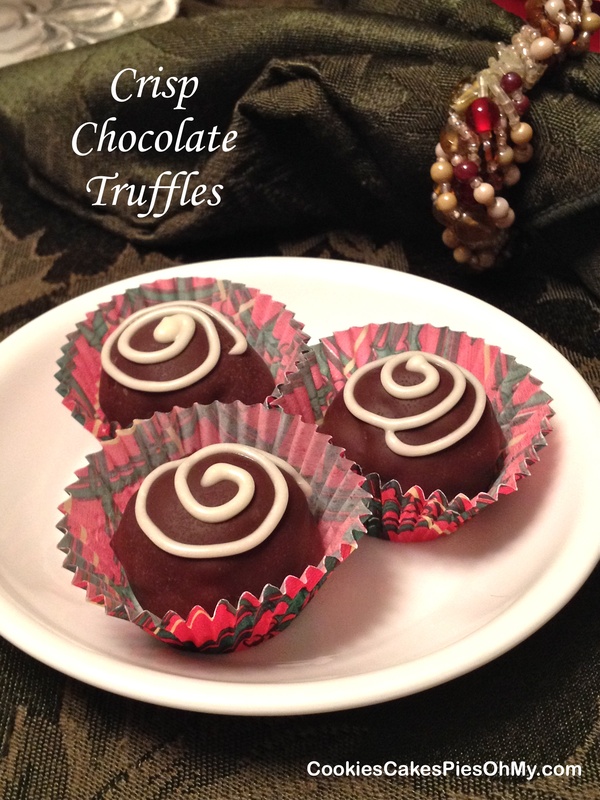 Drop by small scoopfuls onto silpat or waxed paper lined cookie sheet. Shape into round balls and refrigerate about 1 hour or until firm. Melt bittersweet chocolate and shortening slowly over double boiler. Dip each chocolate ball in melted chocolate, let excess drip off, and place back on the silpat or waxed paper lined cookie sheet. I use two forks. One (my meat fork with long tines) to scoop up the chocolate covered truffle and let it sit on the tines, drip, and then swipe across the bottom (with a dinner fork) to remove excess chocolate. That is my way, let me know if you have a better way, I’m willing to learn! Melt white chips (if using) and place in zip lock bag. Cut tiny hole in corner of bag and drizzle over truffles. Refrigerate until firm. Place in small candy paper cups. Keep in airtight container.